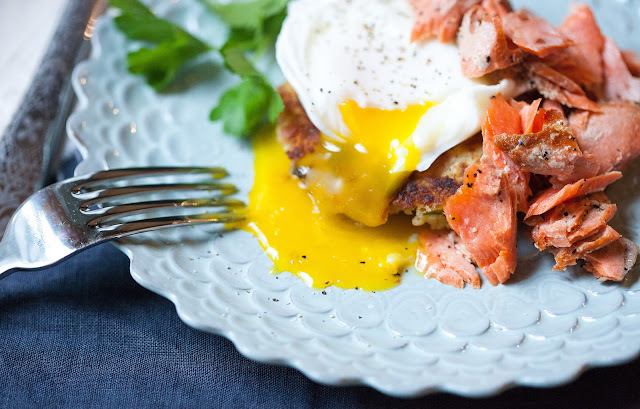 Poached eggs seem to be all the rage right now... in that what's-old-is-new-again sort of way. 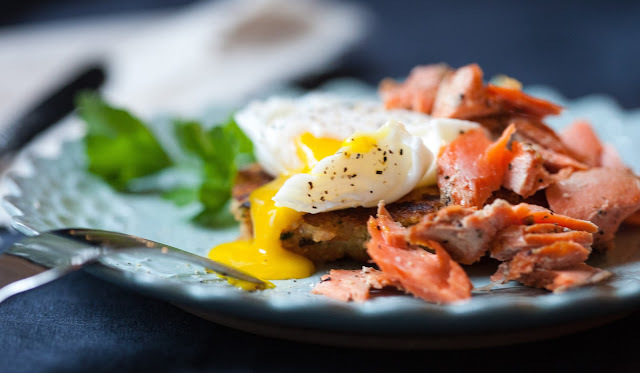 Whether online or out to dine, these perky little pockets of yolky perfection appear to be quite popular and versatile... draped over crisp little toasts, or propped atop a soup, salad or pasta. While their presentation is less than subtle... bold and starkly devoid of hue except for the bright promise of what lies within... their mild flavor and ability to meld and mingle without stealing the show makes them a perfect complement for a range of platings. Recently I tasted a lovely little brunch dish* that delivered a nicely poached egg perched atop a potato and quinoa cake with bits of salmon nestled alongside. All the components worked so well together and, certainly, the egg got my attention. However, it was the addition of quinoa in the cake that sold me on the need to try these at home... particularly since my taste was but one bite. The opportunity to meld some added goodness into a fairly standard fixing is always a plus in my book. Relatively high in calcium and a good little source of protein, quinoa is gaining popularity in vegan dishes and among those who are lactose intolerant. Having removed dairy from my own diet, quinoa is a great little additive... especially when utilized as a bit player, where it adds value but isn't required to take center stage and carry the whole flavor tune. A good little mincing of green onion and Italian parsley adds a nice pop of brightness to the cakes and a light "crumb" coat delivers a touch of crunch when fried. It's a good little patty to plate with salmon... whether sautéed on the spot or warmed up from leftovers. And... of course, there's the yummy goodness of that egg... just begging to be pierced. Return drained boiled potatoes to cooking pot; add milk (or soy milk) and butter. Mash until combined and smooth in texture. Season with salt and pepper to taste. Add quinoa, green onions and parsley to potato mixture (the mixture will be fairly thick). Divide mixture into six portions and roll each portion into a ball. Carefully roll each ball in ground Pita chips (or panko) to add a delicate crumb (note: if you want a heavier crumb coating, gently dip balls in an egg wash before rolling in crumb coat). Form each coated ball into a patty. Set aside. Using a fork, gently separate salmon into bite-size pieces, along natural grain. 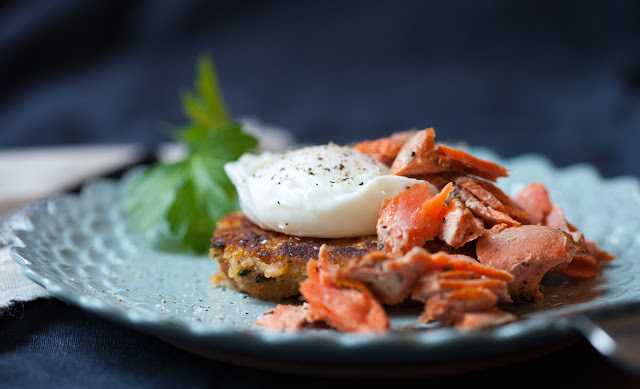 Place one potato-quinoa cake on each plate, carefully top with a poached egg and 1/4 to 1/3 cup of cooked salmon. Season top of egg with kosher salt and black pepper, to taste. Serve immediately.